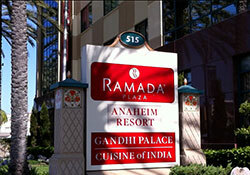 Enjoy these Disneyland area hotels and walk to Disneyland Park in Anaheim, California. These hotels are located within 1-2 blocks of Disneyland and California Adventure parks. 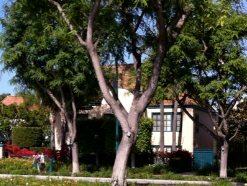 Walk to the nearby Anaheim Gardenwalk and enjoy the restaurants. 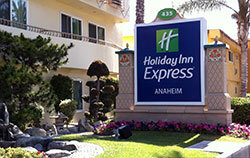 These hotels are located on or near Katella Avenue, within 10 minutes walk to Disneyland main gate. 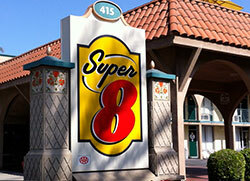 Many of them offer discount Disneyland hotel packages as part of the Disneyland resort Good Neighbor Hotels. For additional hotels along South Harbor Drive across from the main gate, see hotels near Disneyland. You may also with to consider staying at the Disneyland Hotel Anaheim CA. Check out the pictures and map below for locations of the hotels. You can find some good discounts at Disneyland area hotels from aRes Travel. The Candy Cane Inn is just a 1/2 block walk to Disneyland. AAA discounts. Disney Good Neighbor Hotel. Ranked No. 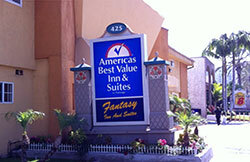 2 in Anaheim hotels by TripAdvisor. The Desert Palms is a Disney Good Neighbor Hotel, ranked #8 by TripAdvisor for Disneyland Area Hotels. Another Disney Good Neighbor Hotel that offers Disneyland hotel packages, the Portofino Inn is located 10 minute walk from Disneyland main gate. 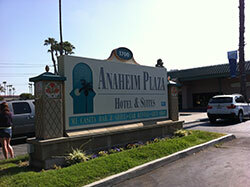 The Anaheim Plaza Hotel offers Disneyland hotel discounts and an easy 10 minute walk to Disneyland. Large outdoor swimming pool. The Holiday Inn Express is rated no. 6 in Disneyland area hotels by TripAdvisor. A few more minutes of walking than some other hotels, but nice location near restaurants like the Cheesecake Factory. 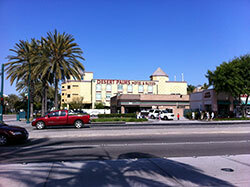 A good value hotel for the budget, located near Disneyland. 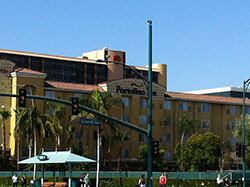 For additional hotels along South Harbor Drive across from the main gate, see hotels near Disneyland main gate. You may also with to consider staying at the Disneyland Hotels. For a great map of Disneyland CA, just click on the link above to view Disneyland California, and the map of Disneyland area hotels.